Prior to World War I, much of our planet was a vast unknown land, characterized by rumor and fantastic stories, and described by epic myths. 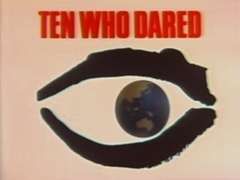 This amazing ten part series, Ten Who Dared, dramatizes the journeys of ten intrepid explorers whose ambitious and heroic adventures changed the landscape of the unknown world, sorting fact from fiction, myth from reality. Program 1 recreates the famous voyages of Christopher Columbus as he sailed west across the Atlantic Ocean, looking for a trade route to Asia. How Francisco Pizarro, conquered the vast Inca Empire for Spain in 1532-3 with a handful of soldiers is recreated in Program 2. Program 3 looks at Captain James Cook's epic three year journey around the world from 1768 - 1771. Program 4 follows the explorations of German naturalist and traveler Alexander von Humboldt as he trekked the Orinoco river basin of Venezuela in 1799. Program 5 recreates the epic western journey of the famous American fur trader, mountain man and explorer Jedediah Smith in 1826. Program 6 chronicles the first south-north crossing of the formidable Australian interior by Robert Burke and William Wills. Program 7 follows the journey of Welsh journalist Henry Morton Stanley as he attempts to prove the Lualaba River is the long-sought source of the Nile. Program 8 recreates English poet and writer, Charles Doughty's fantastic 1876 - 1878 Arabian journey. Based on the writings of English woman Mary Kingsley, Program 9 follows her incredible trek across West Africa in the early 1890s. Program 10 covers the last 788 miles of Norwegian explorer Roald Amundsen's epic conquest of the south pole in 1911.